Best of Wedding, published by Santorella Publications, contains the most popular selections of wedding music in print including a fabulous edition of Love’s Theme From Romeo & Juliet as well as both the Bach/Gounod & Schubert’s editions of Ave Maria. 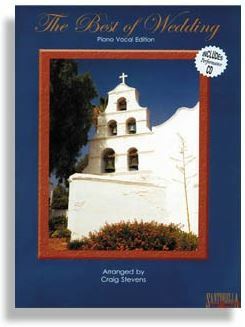 This best selling piano vocal collection is masterfully arranged and performed by Craig Stevens. Celebrate your joyful day with these time honored classics. Each piece is also featured on the accompanying performance CD. Listen to over 20 tracks and 80 minutes of beautiful wedding music on one CD!